Treasure Hunt is a prize redemption, arcade machine. The game has a simple and fun game play concept that is easy to play for all ages that requires keen hand and eye co-ordination and decisive action. Players insert a coin/s and use the joystick to move the push rod under the gift they wish to try and win, but you have to be in place in 25 seconds, so decisive action is a bonus in this game. Once the push rod is in place, hold down the 'up' button to push the rod up and once the rod is up to the hole, release the 'up' button and move the rod forward. Players get their prize when the push rod pushes the gift out of the box. 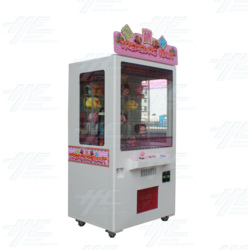 Players insert a coin/s and use the joystick to move the push rod under the gift they wish to try and win, but you have to be in place in 25 seconds, so decisive action is a bonus in this game. Once the push rod is in place, hold down the 'up' button to push the rod up and once the rod is up to the hole, release the 'up' button and move the rod forward. Players get their prize when the push rod pushes the gift out of the box.